This beautiful Melissa & Doug jumbo brown teddy bear is over two feet in every dimension and features soft, furry fabric and a classic teddy-bear look. Soft and huggable, this timeless teddy will delight bear lovers of every age. 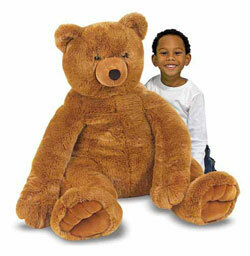 Bring endless bear hugs into your child’s life with Jumbo Brown Teddy Bear from Melissa & Doug. This brown bear sits at over 2 feet in every dimension and offers classic teddy bear features in addition to sturdy, soft construction. With its timeless look, Jumbo Brown Teddy Bear will delight teddy bear lovers of all ages. Jumbo Brown Teddy Bear has a soft, plush construction that makes it a wonderfully huggable stuffed animal. Sitting at 30 inches and standing at 36 inches tall, Jumbo Teddy Bear’s size makes it a loveable, huggable (and sometimes life-size!) toy. Children can hug or hold Teddy Bear like other stuffed animals and can also use it as a giant pillow to sit or lie on. Durable construction means that children can also wrestle with the bear, which encourages the development of gross motor skills. Classic teddy bear details such as small rounded ears and a tail make this bear an enjoyable presence for old and new bear lovers alike. Its kind face makes for an amicable presence in a child’s life. Its long limbs, large stature, and endearing face make Teddy Bear fun to play with, not just as a toy but also as a furry friend. Teddy Bear is a wonderful companion for soft, cuddly play, and its presence can help children develop their imaginations through stories and relationships. Our testers enjoyed hugging and petting the bear, but found that it lost a fair amount of hair during play. This didn’t seem to change the overall look of the bear, however, as it did have thick, soft hair to begin with. Started in the garage at Doug’s parents’ house in 1988, Melissa & Doug has become one of the most popular toy makers in the world. Its toys have garnered dozens of awards and have been widely featured in national media. This beautiful Melissa and Doug Jumbo Brown Teddy Bear is soft and cuddly furry friend, huge at an impressive three feet tall when standing. Cute, this plush bear has a soft furry fabric and classic teddy bear look. So life like – standing 36″ tall, he is a soft, cuddly, premium-quality giant plush. This impressive stuffed bear has realistic characteristics and is perfect for play or display. Classic teddy bear details such as small rounded ears and a tail make this bear an enjoyable presence for old and new bear lovers alike. Quality construction – durable construction means that children can also wrestle with the bear, which encourages the development of gross motor skills. Melissa and Doug have been makes quality stuffed animals for over 23 years including a variety of teddy bears. Some people report the fur can shed a little. Note: Although Amazon states the teddy bear measures 19.5 x 20 x 24.5 inches (which is why people are surprised when they receive it). The manufacturer lists the size as 30 x 27 x 30 inches. There are many positive reviews and everyone talks about the huge size and quality. One reviewer commented that its very soft and cuddly. Though very durable, our son takes it to bed, lies on it for a pillow whilst watching television, and wrestles with it playing. Would recommend this bear for all kids. All ages love this bear. One reviewer stated this bear is excellent for your kids if they are 1-3 years old. Don’t worry it’s still a big lovable giant. But for little kids, they will love to be inside the hugs of this soft bear. Bought one for my wife and she loves it too. Many people talked about how soft the fur was. A reviewer stated I was looking for a jumbo bear, not too expensive, for my 14-month old son. I wanted to find a “WOW” gift for Christmas morning. This is it! The fur is soft, but sheds a little. Check out all our plush bears by clicking here. This Melissa and Doug Jumbo Brown Teddy Bear makes for a lovable playmate, gets yours today.